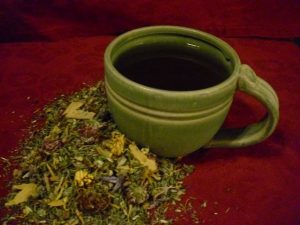 A delicious herbal tea, bursting with natural-source vitamins, minerals & anti-oxidants. Made with herbs grown on our own little “Quarter Acre Farm” using no pesticides or artificial fertilizers, ever. Berkshire Meadows Herbal Health Tea contains no caffeine, and a cup after dinner will help digest your meal and bring a restful sleep when you retire. Tasting it reminds one of a walk through the flowering fields of the Berkshires in high summer. With hints of mint, chamomile, yarrow and more, one can almost feel the gentle energy of the herbs infuse your body with the vitamins and minerals you need, that are straight from the earth, just as vitamins & minerals are meant to be. As that feeling of well-being embraces you, enjoy the newest addition to your health experience! It is good for after an exercise workout! RESTORE VITAMINS AND MINERALS LOST DURING EXERCISE NATURALLY WITH BERKSHIRE MEADOWS HERBAL HEALTH TEA!